Membership Rewards (MR) are the points currency of American Express which transfer to airline and hotel partners. As you can see, once you ‘link’ a program, that specific partner tile moves from ‘Select a loyalty program to link’ to ‘Your loyalty programs’. Step 1: Create a frequent flyer account. 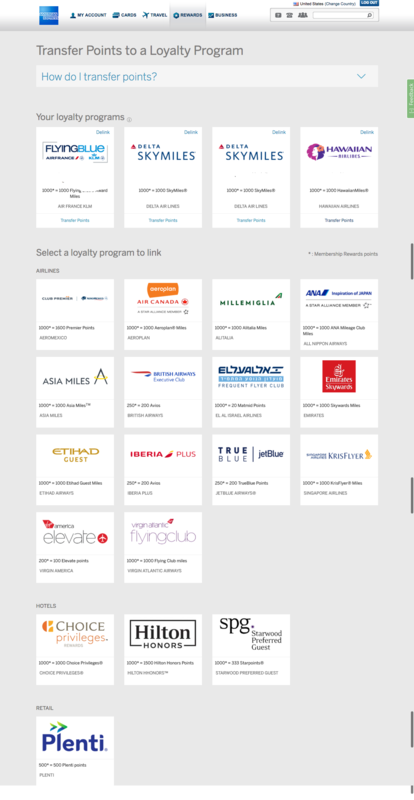 Though you can enroll in any of these programs on the Membership Rewards page, I find it easier – and less confusing – to do it on the airlines own frequent flyer page. Once you’re logged into your American Express account, your Membership Rewards earning cards will show your points balance. Below that you’ll have an option to ‘Use Points’. I’ve noticed that those two options switch positions sometimes, but either way, you want to select ‘Transfer Points‘. That will bring you to the partner programs page (see above). The 3 digits on the back of that Membership Rewards earning card. ‘Card Holder to Link’ – If you have an authorized user on your account, that user can be linked to your Membership Rewards account. This will allow you to transfer points to that authorized users frequent flyer account. In any event, the linked partner program must match the name on the card – even if it’s an authorized user. ‘Which Membership Rewards earning card…’ – You can use any Membership Reward earning AMEX card you have to verify with the front 4 digits and back 3 digits. ‘Frequent flyer…’ – If you’re linking an authorized users frequent flyer account, that information must match the first step (‘Card Holder to Link’). The name on the account and card must match. After successfully linking programs, you’ll be prompted to ‘Transfer Points’, or you’ll be redirected about 10 seconds to the transfer page. Transferring points is extremely straightforward. You’ll be prompted to enter the about of Membership Rewards you’d like to transfer and then AMEX will tell you how many points that equals in the partner program. If you add a partner now, and wish to transfer later, follow the steps above and your program will be part of ‘Your Linked Programs’ section. Not all partner programs are 1000:1000 and not all are instant. Occasionally AMEX has transfer bonuses of 25% – 50%. You can view a historical record of transfer bonuses here. Most commonly, British Airways Avios has a transfer bonus (as high as 50%) which brings the 250 Membership Rewards : 200 Avios to a more respectable parity. In some cases these may take longer, or less tiem, but a majority of them are instant or within 24 hours. Transfer times are important to keep in mind when dealing with rare award space. The Membership Rewards program has a lot of solid partners, though not all are equally as good. Some have specifically great uses, while others are very solid across the board. Here’s a sample of some with quick transfer times, easy to redeem and good value when redeeming awards. Air Canada Aeroplan – Air Canada’s Aeroplan is a member of the Star Alliance. Though they pass on fuel surcharges on certain airlines, they don’t on: Air China, Brussels, United, EgyptAir, Ethiopian, EVA Air, SAS Scandinavian Airlines, Singapore Airlines, Swiss and a few others. This makes Aeroplan miles valuable for getting to most destinations around the world, particularly Europe. For Europe they charge 55,000 one-way in business class – one of the cheapest, without fuel surcharges. Air France / KLM FlyingBlue – one of the best uses of Air France/ KLM’s frequent flyer program FlyingBlue, is that Israel is considered part of Europe. That means one-way coach tickets are 25,000 or 62,500 miles in business class. That’s before the frequent promotions they have where award tickets can be 25 – 50% off. All Nippon Airways Mileage Club – Though they do pass on fuel surcharges and require all tickets to be booked roundtrip, ANA, also a member of the Star Alliance only charges 65,000 miles roundtrip form the U.S. to Israel. Delta Skymiles – Yes, Delta does have constant devaluations, but usually have solid award space in business (and coach) from the U.S. to Europe for 70,000 Skymiles each way. Add your Membership Rewards to the often lucrative Delta Skymiles credit cards (also from AMEX). Depending on your destination and travel preferences, each program has something unique to offer. The fee is $0.0006 per point. For example, if you transfer 50,000 Delta Skymiles from Membership Rewards, you’ll pay an additional $30. This can be offset with more Membership Rewards, or by charging the fee to your card of choice. The max for this charge is $99. Believe it or not, the travel hacker / credit card reward blogs industry is pretty crowded *gasp*! Travel is Free – Though he hasn’t posted in some time, Drew has some of the best guides to award programs (Cathay Pacific’s Asia Miles, stopovers on United), out there. He also has really useful maps by hotel chain that show hotel categories for using points. Doctor of Credit – Doctor of Credit, or known as ‘DoC’, has such an extensive knowledge base about everything related to credit cards. Churning rules? Check. Checking account bonuses? Check. What does and does not count as direct deposit? Check. Literally. Everything. 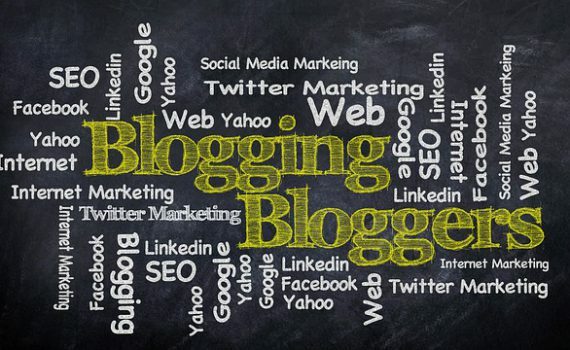 TravelBloggerBuzz – If you want sarcasm and are jaded with the “hobby”, look no further. MileCards – From what I understand, this is a corporately owned website, but that doesn’t prevent the authors from writing really solid content pieces on award space trends. They also write excellent and thorough beginner’s guides. One Mile At a Time – I know I may get some heat for listing this, but if you’re looking for a first or business class review on a obscure carrier (Air Serbia, anyone?) then Lucky is your go to guy. Cranky Flier – Cranky doesn’t write about credit cards or rewards, but he does write well written and topical pieces about the ongoing changes and challenges in the aviation industry. If you were every looking to learn more about how airlines work, Cranky is a great place to start. Even for the uninitiated. Saverocity Network – On here, Travel Is Free is part of that network, but the bloggers there tend to produce really different content. They also don’t push credit card links and tend to write about personal finance, cruise vacations and commentary on the points and miles industry. This is an much delayed post as part of a trip we took during Thanksgiving 2016 to London and Barcelona. DISCLAIMER: I’m not a food critic/blogger or rabbi. Traveling to cities that have smaller kosher-keeping populations can make it difficult to enjoy your time in the locale. After all, eating the local fare helps you immerse yourself more into the culture and environment of your visit. Barcelona has one kosher restaurant in the touristy areas and thankfully, it’s quite good. Throughout our trip of 3 nights and 3 days, we went there for four meals: two dinners, one lunch, and one to-go meal for the flight home. We found the service to be quick, efficient, and warm! This place was always packed (after all, it is the only kosher place). The food was always prepared fresh, and the prices were cheaper than I expected. Restaurant Maccabi has a fun aesthetic and authentic feeling decor in the heart of the city. As far as the food goes, skip the desserts (which are obviously non-dairy), and go for the signature and authentic dish such as the chicken paella. It is open Sunday – Thursday from 12:00 PM – 11:30 PM, Friday 12:00 PM – 4:00 PM and closed on Saturday. Restaurant Maccabi is situated right in the heart of the city on the most famous thoroughfare in Barcelona, La Ramblas. From our hotel it was about a 20 minute walk, but the city’s easy to use public transportation is an option as well. The TMB (the main public transit operator in Barcelona) stop is ‘Liceu’ via the L3 line. Nearby is the Gothic Quarter with several attractions like the Barcelona Cathedral and the Picasso Museum. I’d also encourage you to walk down La Ramblas before/after dinner as there are markets lined up all along the pedestrian walkway. Would I want to eat at the same restaurant for more than 3 -4 meals in a row? Not particularly, no – I don’t think anyone would. 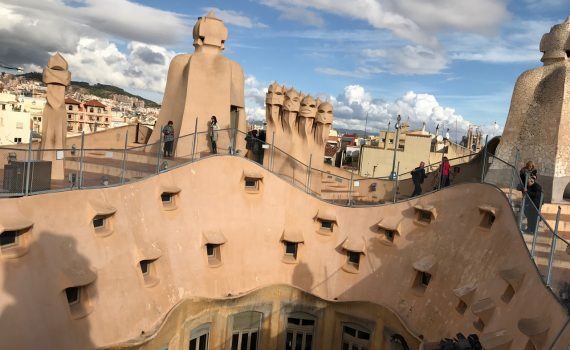 However, we were able to see all the main attractions in Barcelona in a few days which means you won’t be going back to Restaurant Maccabi too often. The Starwood Preferred Guest (SPG) credit cards from American Express are back up to 35,000 bonus miles after qualifying purchases. They’ve change the spending requirements, but the card benefits are staying the same. As AMEX cards one once per life time, this would be the best time to get the card with an all time high offer. An additional $2,000 spent within the first six months of an additional 10,000 bonus points. This would give you a total 40,000 SPG points after the spending. An additional $3,000 spent within the first six months of an additional 10,000 bonus points. This would give you a total of 43,000 SPG points after the spending. What Can I Do With SPG Points? Now, these benefits are not amazing. They used to be worse, but SPG points are pretty difficult to come by, as you can only earn them from two cards and/or from staying at SPG properties. SPG points also transfer to many airlines at a 1:1 ratio; but for every 20,000 points you transfer, you get a 5,000 bonus. So, if you got both cards, you’d have 83,000 points. 80,000 would transfer as 100,000 points to a lot of great airlines! (There are 118 airline transfer partners. Notable ones include: Alaska, American, JAL, British Airways, Aeroplan, Miles and More [Lufthansa], and many more). Or, you could use it for hotels. SPG has some really great properties and I find the solid ones to be fairly priced. Some properties are extraordinarily expensive and you’d get no more than 2 or 3 nights from your new stash of SPG points, but others are lower categories and can help you stretch your points. And stretch ’em you should. Finally, you can transfer these points to Marriott (or vice-versa) at a 1:3 ratio. So if you were to get both cards (after spending), you’d have 249,000 Marriott points. The offer expires April 5, 2017. If you’ve never had either of these cards, I’d recommend applying before the offer expiration date. 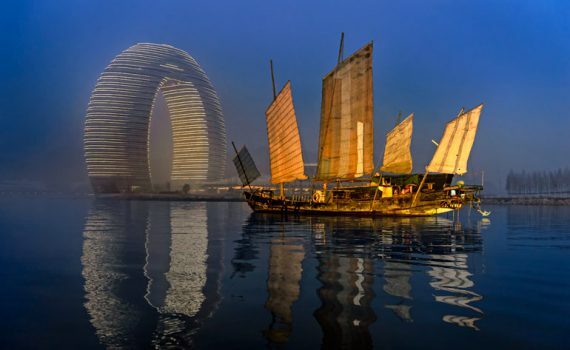 Feature image courtesy of Starwood. For the New Year, my wife and I were supposed to be in Hawaii and Sydney. Unfortunately, we were unable to go and had to cancel and reschedule our trip. I had originally booked us from Honolulu to Sydney on Hawaiian Airlines’ flight for 40,000 miles each way, per person, for a total of 80,000 miles. From the U.S. to Australia that’s not too bad. It was in coach; however, I’ve flown Hawaiian’s coach on their A330s and it’s not bad as the seat configuration is 2 x 4 x 2. 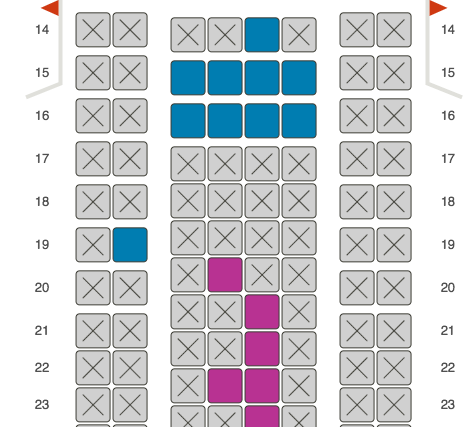 If you can snag the 2 seats on either side of the plane, you’re in for a much more comfortable ride. Hawaiian has several level for booking award seats. The first in each class of service is the cheapest (the “saver” vs the “standard”). These “Super Saver” fares are the ones which allow you to book certain flights on partner airlines. For reference, here’s the award chart. Having figured out new dates when we could go (to just Hawaii), I started my search, resigned to the fact that I now had 80,000 excess Hawaiian Airlines miles in my account. I was definitely okay flying coach – after all, I had done it before and it was a more than fine experience. But then… a unicorn! 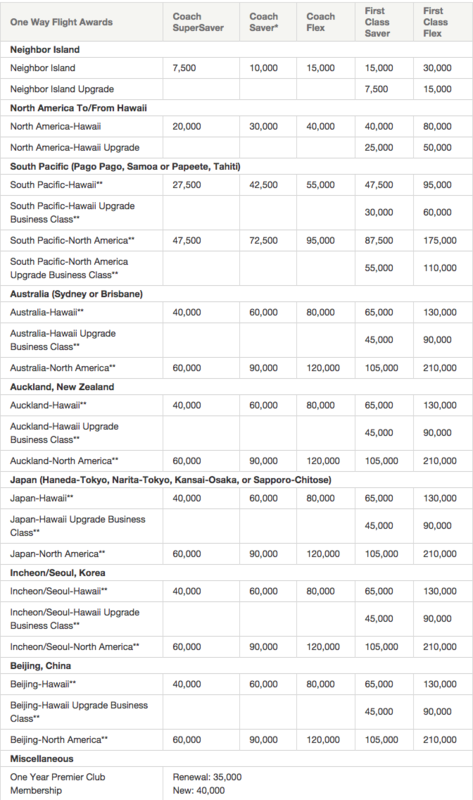 40,000 Hawaiian Miles for First/Business class seats in the new business class seats. It was reported in May of 2016 that Hawaiian would be updating their business class product to fully flat seats across their fleet. There was slim chance it would be installed on their aircraft which flies form New York to Honolulu and back so quickly. 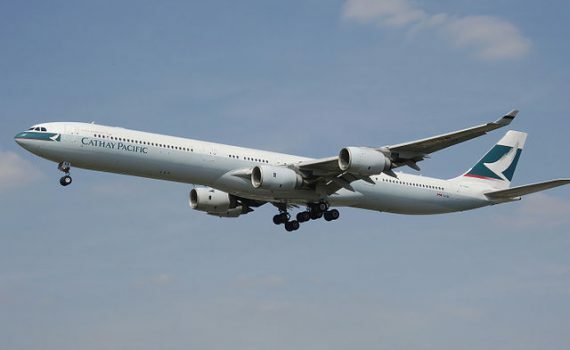 Alas, that was updated and the first fully flat equipped A330 will fly on February 19. I depart February 20 – that means I’ll probably be the second or third person in that seat. How exciting! So, how do you find award prices for Hawaiian? Unfortunately, they do not have an easy to use award calendar (like Delta), but they do have something a step up from British Airways. I searched everyday from February 20 to December 14 – for 1 passenger – and found zero business saver award seats. By zero I don’t mean one – I mean zero! There were plenty of Business Flex fares which cost 80,000 one-way – no thank you, Hawaiian. And not a single seat available at the Saver level. And for the way back? Sweet, sweet, Business Saver awards. This was the only day – out of 297 – that I was able to find First/Business Saver award seats. The bigger story here is that there is only one – out of almost 600 flights – First/Business Saver award seat. I’d say this smells like Delta Skymiles to me, but at least they release some Saver business class seats. And specifically for Hawaii, United, Delta and American operate several routes with fully flat seating from cities like New York, Atlanta, and Washington D.C. Their award pricing is about the same, too. The availability may not be plentiful, but they do offer some award seats. After the launch of the Cathay Pacific credit card from Synchrony, I thought I’d put together a list of all the other co-branded airline credit cards (of which there are many). 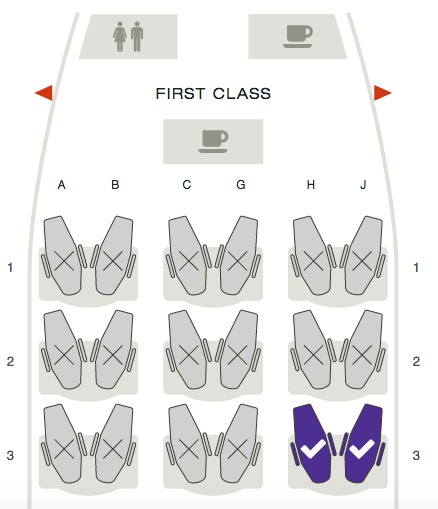 Aeromexico has a very solid award chart – in theory. In practice they pass on fuel surcharges on all flights. Aeromexico is also a transfer partner of AMEX Membership Rewards. Thee companion ticket and “buy three, get a fourth free” sound like they could be useful benefits; however, the restrictions that they be booked into higher/full fare classes will be cost prohibitive more most. 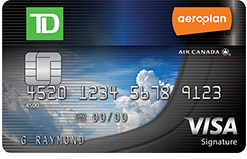 Aeroplan is the frequent flyer program of Air Canada. For TD Bank, this is a pretty solid product. It’s nice that the annual fee is waived for the first year with a low spending requirement, too. Aeroplan miles have lots of great uses (particularly to Europe) and you can transfer from AMEX Membership rewards to top off your account. I’d only go for this if I was out of options, but it’s something to consider. 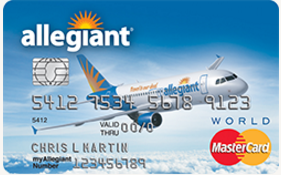 Allegiant points are worth 1 cent per point, so the sign-up of 15,000 points is worth $150 in travel. 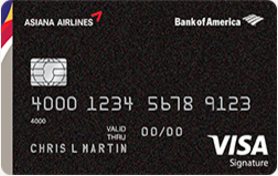 This may make the card worthwhile for some; however, there are several other Bank of America cards that I’d recommend before getting this (Asiana, Alaska Airlines). First National Bank of Omaha pulls from different credit bureaus depending on where you live. Asiana Airlines is a Star Alliance (the same alliance as United) member based out of South Korea. The yearly 10,000 bonus miles is intriguing, but the assumption is, is that you need to keep the card open for a full year before they’re awarded. In any event, the sign-up is solid (if not with a steep minimum spending requirement). Best of all? This card is issued by Bank of America, meaning it’s possible to get several of these per year (or at a time). Considering the no minimum spend requirements, the ‘Vuela’ flavor is not such a bad offering, but the annual fee of $149 is pretty steep. Be sure to use code AVSPWE on your application for an additional 20,000 LifeMiles. Banco Popular pulls from Transunion. Japanese Airlines (JAL), also a member of the Oneworld alliance has a solid award chart. It doesn’t get much attention primarily because you can easily book award flights using partner miles (American AAdvantage miles on JAL). More importantly, JAL Mileage Bank miles only transfer form Starwood. The above is the standard earning on the card. The sign-up bonus is 5,000 miles, but you’d have to fly on JAL internationally in order to receive the bonus. 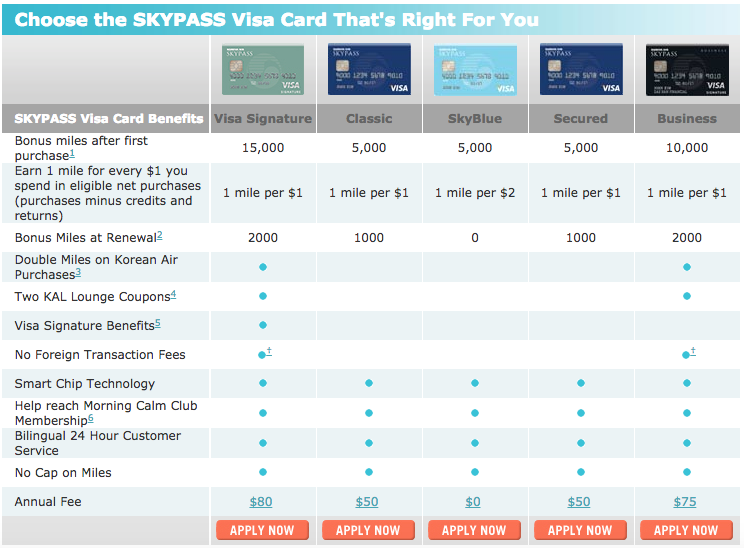 Korean Skypass, a Skyteam member, has an excellent credit card from U.S. Bank. It doesn’t get much love because the standard sign-up bonus is small; sometimes U.S. Bank sends out targeted bonuses of 30,000 miles. If you get that offer, this card may make sense for you. With the exception of the SkyBlue version, they all have an annual fee. For 15,000 miles (Visa Signature), I’d skip, but for 30,000 it’s worth considering. Outside of the bonus, there’s nothing else exciting about this product. Korean Skypass miles are also a transfer partner of Chase Ultimate Rewards, providing an easy way to add to you Skypass balance. LANPASS is the frequent flyer program of LATAM Airlines, based in Chile. They are a member of the Oneworld Alliance. While the mileage bonus for being a card member is nice (especially if you fly on revenue fairs often), it’s a bit odd that there is a spending requirement to activate this benefit. The award chart is distance based and there are some decent offers to be had. I don’t think this card gets much attention, but it is a transfer partner of Starwood Preferred Guest and transfers at a 1:1.5 ratio. There are some solid short-haul redemptions to be had like 10,000 LANPASS kilometers for a flight from New York to Chicago on American Airlines. See here for a great write up on best uses. *With U.S. Bank, if you’re not approved for the Visa Signature card, but are approved for a standard Visa, you’ll receive an inferior sign-up bonus of 15,000 miles. With the merger between Alaska Airlines and Virgin America, it’s anyones guess what will happen to this card. 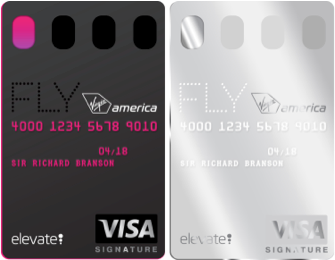 In the meantime, the only reason I’d suggest getting this card is to transfer your miles from the sign-up to Alaska for the conversion of 1 Virgin America Elevate mile to 1.3 Alaska Mileage Plan miles. The Premium Visa is the superior offer, but both carry an annual fee (the second being pretty hefty). One of the more interesting benefits of the Premium Visa is the waiver of cancellation and change fees. If you fly Virgin America enough, that annual fee of $149 would be covered if you had to change your flight twice. Without this benefit, it would cost you $100 – $150 per change or cancellation on non-refundable tickets. No word on when/what will happen to these cards, so if you were thinking about getting one, now would be the time. It appears that Comenity favors pulling from Equifax or Transunion. When I conceptualized this list, I thought it would a lot of garbage offers. I was pleasantly surprised to see that there are some solid non-major co-branded airline cards out there. Some of my top picks for consideration would be the Avianca Vuela Visa, Korean Skypass Visa, or the TD Aeroplan Visa. 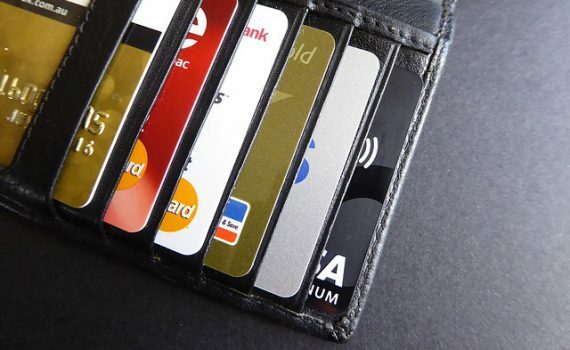 Co-branded credit cards are big business for all parties involved. Though this is pure conjecture, I think a waiver on annual fees for the first year OR more lucrative sign-up bonuses would go a long way to securing new customers. Did I leave any co-branded airline cards out? New Cathay Pacific Card: No Thanks! Is it a worthwhile addition to your wallet? 1.5x points per dollar on dining in the U.S.
1x point per dollar on all other purchases in the U.S. While the 25,000 point sign-up is paltry (compared to 50,000 – 70,000 point sign-ups), I’m not all that disappointed by that number. Remember: the Alaska Airlines cards from Bank of America used to be 25,000 (they’re now 30,000). However, there is an annual fee of $95 which isn’t waived that makes applying for this card, and keeping it, a bit harder to justify. The spending categories aren’t all that exciting. The 1.5x on all foreign purchases is an interesting twist, but cards like the Chase Sapphire Reserve will earn 3x on dining and travel – even abroad. Where else can I earn Cathay Pacific Asia Miles? Asia miles is a transfer partner of Citi ThankYou Points, American Express Membership Rewards and Starwood Preferred Guest. All transfer 1000 : 1000, except when transferring 20,000 or more from SPG, where you’ll receive a 20% (or 5,000 point) bonus. When do these points expire? Asia Miles expire after three years! Even with this card. That’s a pretty huge disappointment. How can I use Asia Miles? The Asia Miles program isn’t the most straightforward, but you can read all about it here – Travel is Free has a excellent write-up on some cool uses. Where does Synchrony pull from? Typically, Synchrony pulls from Transunion (and sometimes Equifax). For those who are inquiry sensitive this is a nice change. While I’m a bit disappointed with the sign up (plus the $95 not waived annual fee), its great to see some new cards by smaller issuers injecting some new “blood” into the marketplace. On a positive note, it’s great that this will be a new issuer for many churners, plus the fact that Synchrony pulls from Transunion. That being said, the $95 annual fee and earning structure make this card far from worthwhile. You know what the best thing about opening up a new credit card is? The sign-up bonus, of course! Using those points or miles and then getting some back – just for using them! Some credit cards offer points rebates; either for being a cardholder, or using the card. In most cases (with the exception of the American Express Business Platinum) you don’t even need to use the credit card in question for the purchase. You just need to be a card member to qualify for the rebate. The sign up on this card is typically 60,000 – 80,000 IHG points after spending $1,000 – $2,000 in the first three months of card opening. The annual fee is usually waived and each year you receive a annual free night certificate which can be used at any IHG property that has availability. Rebate: Receive 10% of redeemed points back on a maximum of 100,000 points redeemed, per calendar year. 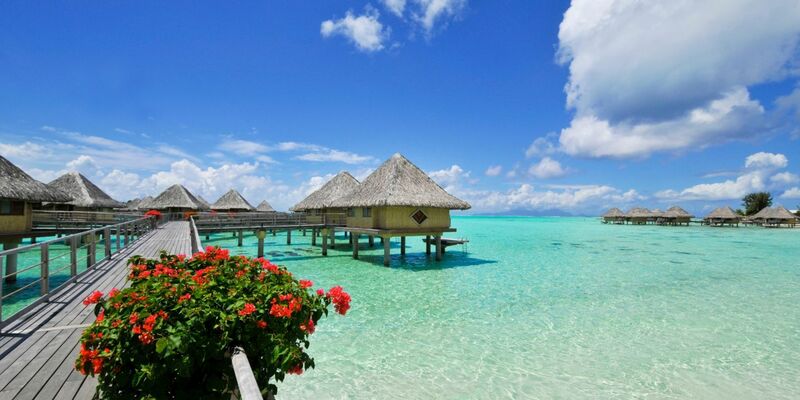 Want to stay at the Intercontinental Bora Bora with points? 54,000 Points after the credit card rebate! Sounds complicated, but quite simply: if you redeem 100,000 IHG points, you’ll get a refund of 10,000 per year. Points rebates typically post after the stay is completed. Though the arrival card used to be a more lucrative, the sign-up bonus is solid (currently 50,000 Arrival points and no annual fee the first year). It does earn a consistent 2% back on each dollar spent, but the redemption benefits were nuked last year and now the minimum redemption must be on a travel charges over $100. Rebate: Receive 5% miles back. Example: You use 10,000 Arrival + points towards $100 hotel stay. You will receive a refund of 500 points back. (5% back from the total sign-up bonus would be about 2,500 points). Even with Citi’s restrictions on getting the sign-up bonuses again within a “card family”, there are still lots of ways to earn AAdvantage miles. Barclaycard recently started allowing new applications for the Aviator Red card – and if you’ve held this card over 2 years ago, you are eligible for the bonus. Rebate: Both of these cards offer the 10% back on miles (max of 10,000) per calendar year. Even if you carry both off them, you cannot stack the bonus for 20% back. This award costs 160,000 AAdvantage miles. Remember, you get 10% back up to 100,000 redeemed miles. The 10,000 (or 10%) back was distributed across both awards for a total of 10,000 miles. If you were to click ‘Promo: 4,000’, a box would pop up and either say “Citi Redemption Bonus” or “Aviator Redemption Bonus”. In efforts to up the ante on their Platinum products, American Express added a new feature this year to the business version that is very similar to the other point rebate features listed in this article – but with a few catches. Travel through the AMEX portal is 1 cent to the dollar, but with 50% of points refunded to you (provided you follow the conditions below), it’s effectively 2 cents per dollar. I wouldn’t recommend using Membership Rewards on this itinerary, but if you had the Business Platinum, you’d pay the 32,000 points upfront and then receive 16,000 back – or 50%. You must book travel through the AMEX travel portal. For itineraries booked in economy class, the rebate is only applied to travel that is booked on your airline of choice (the same airline you choose for your travel credits each year). For itineraries booked in business and/or first class, this rebate applies to all airlines booked through the portal. The terms say that the rebates take 6 – 8 weeks, but evidence here shows that it takes 1 – 2 days. This benefit is really great, though somewhat restrictive (typical AMEX). The terms here say every time – which is less restrictive than other rebates like that offered by the Citi and Barclaycard American Airlines credit cards. Because TrueBlue award redemptions are based off of the price of a ticket, it’s rare that you award ticket will cost 80,000 TrueBlue miles (like an AAdvantage award). Though 10% miles back off of a award ticket that costs 6,000 miles doesn’t seem like a lot, it does add up over the course of a year. In some cases, these rebates don’t seem to be that lucrative; however, in other cases, like with the AAdvantage cards, you’re effectively knocking all award ticket prices down by 10%, which is pretty decent. Points rebates are an additional “bonus” and add an incentive for keeping the card a bit longer. When flying to Hawaii from the East Coast (or anywhere not the West Coast), you’ll most likely need to connect in Honolulu (HNL) – unless you’re connecting somewhere in California. After connecting onto your final destination in HNL, you may wish to visit more than one island. Inter-island flights are short, but can be expensive and overpriced. Most routes are direct, but some require a connecting (in HNL or Maui). Let’s take a look at some of the best uses for inter-island flights with miles and the various options available. And, you can redeem United MileagePlus miles on Island Air as well. 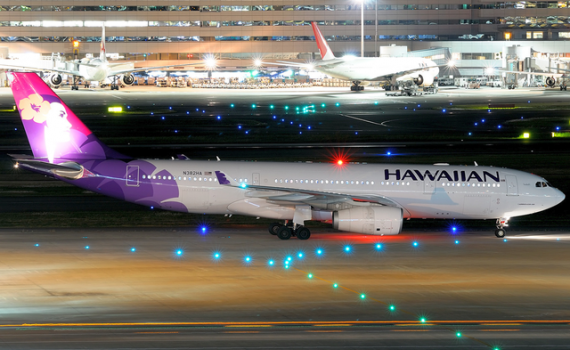 Many airlines have partnerships that allow members to redeem miles on Hawaiian Airline flights. 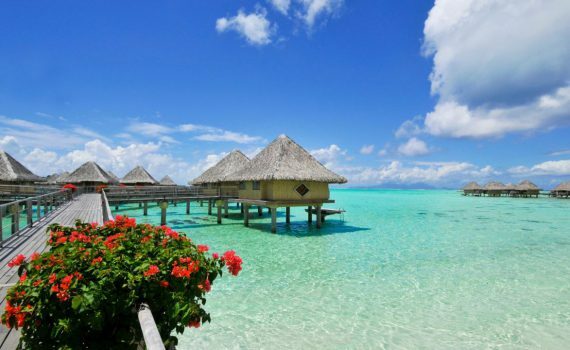 However, these partnerships only allow you to redeem miles on inter-island flights. A few years ago, American Airlines and Hawaiian Airlines had a partnership where you could redeem AAdvantage miles on flights from the mainland to Hawaii (New York – Honolulu, for example). That partnership has ended. Prices are coach only as it would be silly to waste extra miles to fly for 25 minutes in business. The only option here which is roundtrip is when redeeming Korean Skypass miles. Korean Skypass redemptions requires all travel to be roundtrip. However, I would argue that if you’re visiting two islands on your trip to Hawaii, you’re probably arriving into one and departing out another, defeating the purpose of an inter-island roundtrip flight. Though Virgin America represents the cheapest option, I’d caution from using Vigrin America miles on Hawaiian Air. Virgin and Alaska have merged and you can transfer your Virgin America miles to Alaska Airlines for much better value on other, more expensive flights. You can search Hawaiian Airlines flight award by creating an account (for free) and then calling Virgin America Velocity program at 877-359-8474 to book the award. For more information check out Virgin’s dedicated Hawaiian Airlines redemption page cikoywc. Delta and American are at the higher end (and skip American because of the multi-segment pricing; see below) and United is right in the middle at 6,000 one-way. However, I value United miles at a pretty high value and would want to save them – due to Chase making it really difficult to earn the sign-up on the United and Ultimate Rewards cards. American AAdvantage miles and Delta Skymiles are relatively easy to earn, so if you need to burn some points those don’t represent a bad option. While using HawaiianMiles is at the higher end of point requirements, you’ll notice that there is some variability. The 10,000 and 15,000 points per flight option represents the non-saver space. (See: The Difference Between Saver & Standard Award Space). This space isn’t bookable via partners and sometimes might be more desirable times. HA 306 is the flight with saver availability. HawaiianMiles is a transfer partner of American Express (1000:1000). Hawaiian Airlines has two co-brand cards with Barclaycard. The typical sign-up bonus is 35,000 miles after spending $1,000 in three months. The annual fee is $89. There is also a business version. However, the bonus does go up to 50,000 (for the same spending requirement) several times a year. The card also unlocks discounted award tickets, valid on Hawaiian metal only. 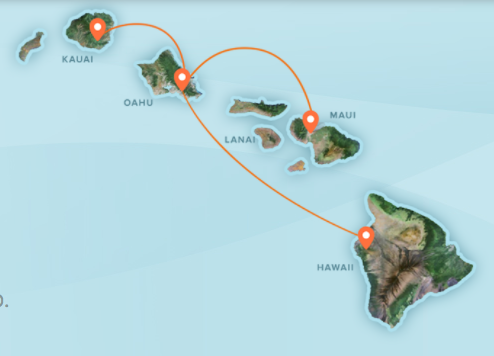 As you can tell from the route map, most of the islands are pretty well connected only requiring one flight from Maui to Kauai, for example. 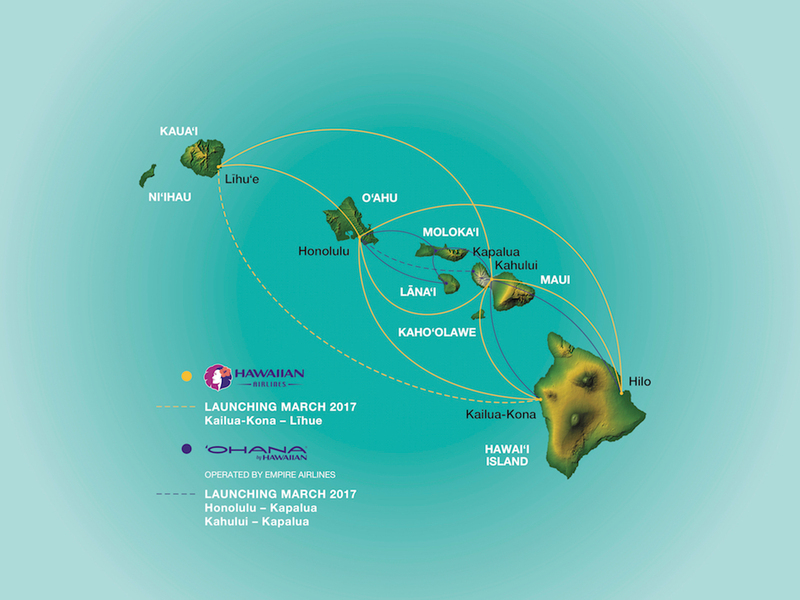 A common example that requires connecting, which Hawaiian is going to be relaunching this spring is Kona, The Big Island (KOA) to Lihue, Kauai (LIH). Currently you need to connect via Honolulu or Maui. But on good ole’ American Airlines, it will be two! So for any multi-segmented flights, do NOT use American miles. There’s large variability in cash prices on inter-island Hawaiian flights. It depends on the route and most often, the time of year you’re traveling. 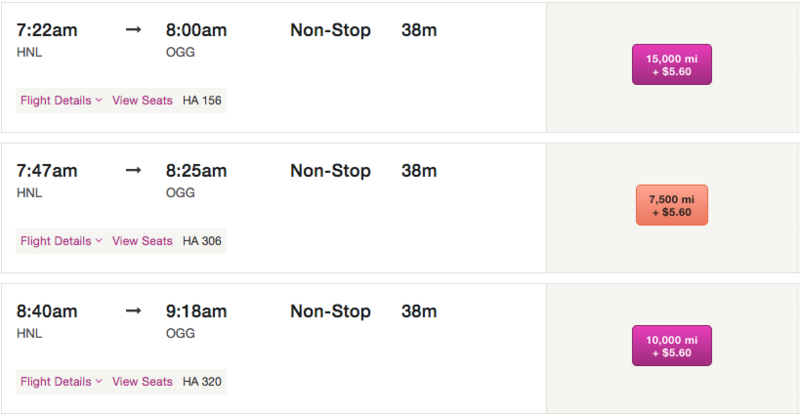 Here’s that multi-segment flight, Kona to Kauai, which is a bit pricier (and would be double if roundtrip). The one thing to keep in mind is that you will have to pay bag fees on these flights and because Hawaii is a leisure destination, I always take bags (as do many of my clients). It is $25 for each passengers first checked bag. You know the drill! You decide! In my experience, I’ve always found that using miles for inter-island flights has been cheaper, but I do always browse cash prices to see if I can save miles. As for which currency I use, I’m partial to Delta Skymiles – as I have many – or HawaiianMiles as American Express Membership rewards are easy to earn, too. My last round of applications (colloquially known as an “APP-O-RAMA”) was in October 2016. I actually got really lucky, considering how many cards I had opened throughout the year. Of the seven applications at that time, all were approved with no calling in necessary. I applied for nine cards. I knew full well that it wouldn’t be as easy as last time… but the results were disheartening. Here is the order in which I applied, and the decisions. Of all the major banks, Bank of America has been the most churner friendly. Though it’s only a matter of time before that changes (and it already has started), I wanted to get some more Alaska cards while I was still able. I’ve also been eyeing the Merrill+ Visa for myself, which I recently picked up for my wife. 1. Bank of America, Merrill+. Decision: Denied, with eventual approval. Reason: Too many new accounts, too many inquires for credit. 2. 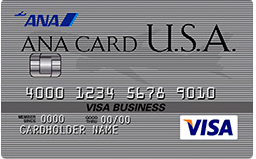 Bank of America, Alaska Airlines Personal Visa. 3. Bank of America, Alaska Airlines Business Visa. Decision: Approval after some fraud verification. Though I was disappointed not to have been approved for the personal Alaska Airlines credit card, I figured two from Bank of America was still pretty solid… And from here, it went downhill. Reason: Too many new accounts, too many inquires. While the personal Marriott card from Chase is affected by Chase’s “5/24” rule, the business version isn’t. Never having had a Chase Business card before (I know – surprising, isn’t it? ), I thought I’d give this one a chance. I also called reconsideration several times, with ultimate failures. Decision: Initially pending, then email approval. American Express will merge credit pulls and will approve you for two cards on the same day. However, I’ve had most other charge and credit cards from AMEX so I went with this – and was pleased with the ultimate decision. Over the past few years, in my experience and in that of others, Barclays tends to have some of the toughest (and most stubborn) reconsideration department reps. The last Barclay card I applied and was instantly approved for was the Aviator Red World MasterCard. That was about two months ago. I did know that this was a long shot because of my recent application… Oh well! Decision: Pending, followed by approval email. I recently received a targeted mailer for this 50,000 point bonus and no restrictive language. I wasn’t surprise that this went pending – nor was I surprised when I received the approval email a few days later. Decisions: Pending, followed by denial emails. Reasoning: Too many new accounts, too many inquires. (1) Freeze Experian, and they’ll pull Transunion and Equifax. (2) Capital One does merge credit pulls for business and personal (unlike Chase or Bank of America), so going for a business and personal in the same day can’t hurt. Though Capital One does get a bad rap – mainly because they pull from all three credit bureaus – I figured it’s time to start branching out as I’m limited more and more by other banks. I knew some of these would be long shots (I’m still going to try reconsideration a few more times), such a monumental failure of applications hasn’t occurred to me in a long, long time. The most common decision for denials? Too many new accounts and too many inquiries. Though inquiries make up the smallest part of your credit profile, to a representative, that many inquires and new accounts can look risky. (See, Let’s Talk About Credit). While I am not planning on fleeing the country with my lines of credit, I do see how this could look risky to a representative. So what’s the lesson I learned? Though inquires matter less than other factors to your overall credit health (and score), they do matter on your report when a human being is conducting a review. 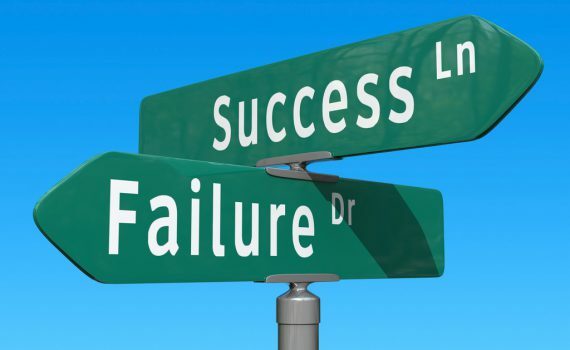 Part of sharing successes, is also sharing failures. I used to be so nonchalant about credit pulls – giving myself the idea that they didn’t really. Practically, this meant I’d apply for a card here, a card there, etc. And while many of us in this hobby understand how small of an impact the inquires actually have on our credit score and the technical impact on the calculation – we must remember that if not automatically approved, a human being may see our obscene number of inquires and be rightfully concerned and cautious. So now? I’ll consolidate applications and be more judicious about freezing Experian.